WICHITA, Kan. – The Kansas Collegiate Athletic Conference is pleased to announce the 2018 Football All-Conference selections and individual award winners as voted on by the head coaches. 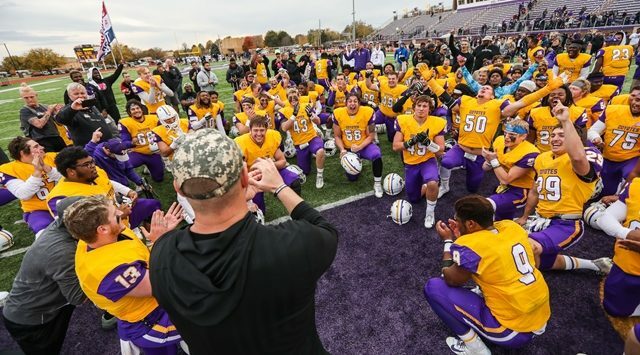 The (6) Kansas Wesleyan University Coyotes are the 2018 KCAC Regular Season Champions with a perfect 10-0 conference record. Matt Drinkall, the Coyotes’ head coach, was unanimously named KCAC Coach of the Year by his peers. Demarco Prewitt of Kansas Wesleyan is the 2018 KCAC Player of the Year, following a junior season where he led the KCAC in rushing (1947 total yards/117.0 yards per game). Defensive Player of the Year honor goes to the conference sack leader, Shaq Bradford, who totaled 19.5 sacks on the season (1.8 sacks per game). In a heavy offensive year for the KCAC, Johnny Feauto of Kansas Wesleyan and Darrion Dillard of Ottawa were named Co-Offensive Players of the Year. Feauto led the conference in passing with 2736 total passing yards, averaging 248.7 yards per game and completing 66.9 percent of his passes, while Dillard led the KCAC in receptions (96) with 1268 yards and 22 touchdowns this season. Southwestern’s Alfredo Botello took home the Special Teams Player of the Year award, while Avila’s Landon Nealy is the Dr. Ted Kessinger Champion of Character award recipient. Tabor’s CJ Hill earns the Assistant Coach of the Year award.